See how the ZEOvit method makes corals pop with color and health! Reef Hacks has all the info here. Unlike many coral foods, Coral Vitalizer interacts with your corals by directly satisfying their carbon demands and reducing the need to harbor massive densities of tissue zooxanthellae (symbiotic algae). Resulting is an increased expression of true tissue coloration. Additionally, Coral Vitalizer puts many hard corals into a continuous “feed mode”, even during the daylight hours. Ever see Acropora showing off sweeper tentacles all day long? Perhaps you would like to; Coral Vitalizer can help. The unique qualities of Coral Vitalizer set it apart from an ever increasing assortment of generic coral foods, providing nearly instant and unmistakable gains for you, the discerning aquarist. Coral Vitalizer contains no Phosphates or Nitrates. Pioneers of the ZEOvit® System, Korallen-Zucht is a German company that has been successfully breeding stony corals in captivity for more than 20 years. If you`re not familiar with the ZEOvit® System, do a Google image search to behold some of the most eye-popping and colorful SPS corals you`ve seen in your life! 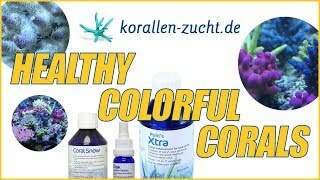 Bavaria-based Korallen-Zucht is one of Europe`s biggest coral farmers and retail/wholesale operations. All their coral nutrition, food, media, and pest treatments are developed in-house. They don`t just slap their name on somebody else`s product. They make this stuff because they want to grow better corals! When I first started using the product I saw good results in polyp extension. After a while not so much. Not sure I can fully justify the cost/actual benefit. Greatly improved the colors and growth of all my corals! Polyps see to have better extension. Pricey, 25 gallon dosing schedule tricky for nano tanks. I have only been dosing for a week or so, however, the polyps of my SPS seem to extended a bit further. Haven't notice a change in colors yet, however, I will be watching the Jedi Mind Trick Monti closely. For the price of this, I guess I expected miracles. I have used it everyday faithfully for over 2 weeks now and have not noticed any difference. I gave 3 stars just incase it needs more time to work. At this point, NOT worth the money! I have 35 frags and NO anything.